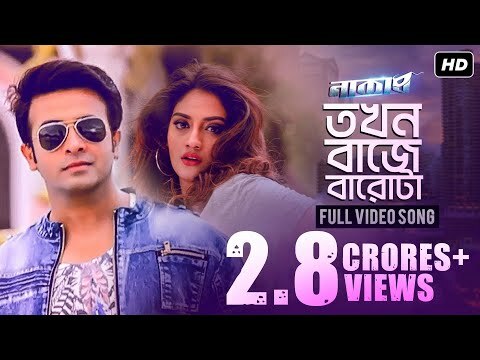 Groove to the foot tapping number from #Naqaab that features the sensational #ShakibKhan, and the gorgeous #Nusrat Jahan. Directed by Rajiv Kumar, this song has been sung by Nakash Aziz, Gopika Goswami, Dev Sen and Tanish. The song has been composed by Dev Sen, while the words were penned by none other than Prasen. Song Name : Tokhon Baje Barota. Singer : Nakash Aziz, Gopika Goswami, Dev Sen & Tanish.